Importantly, HELP is a patient-centric intervention, with the intervention tailored to, and directed by the needs of the individual. Patients receive personalized interventions congruent with their in-the-moment needs throughout their hospitalization course. Multicomponent non-pharmacological approaches such as HELP are best implemented using a multidisciplinary team. HELP has been successfully developed and implemented utilizing a variety of staff such as nurse practitioners, nurses, nursing assistants, and volunteers.2 At the same time, emerging technologies provide an opportunity to extend the reach of single and multi-domain interventions such as HELP in hospitals, without the requisite clinical resources or volunteer base. 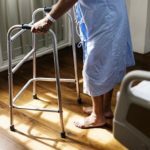 One of the most significant adverse events associated with older adult immobilization while in hospital is falls. Room sitters remain the standard of care for fall risk prevention, but a number of emerging academic and commercial technologies are being utilized to reduce dependence on in-person interventions to address fall risk. For example, the neuroscience unit at Mission Hospital in Asheville, North Carolina eliminated unassisted falls injuries over a 3-month period in 2015 (https://catalyst.nejm.org/reducing-inpatient-falls-virtual-sitter/).3 The unit accomplished this through virtual sitter technology deployed via a Microsoft Kinect. The Kinect uses depth and infrared sensors to visualize patient movement, and in combination with two-way communication, allows for the deployment of virtual sitting. In analysis of the components of the intervention utilized, verbal redirection through two-way communication was found to account for 50% of the system utilization. Commercial fall prevention products such as Careview Communications (https://www.careviewinc.com/) and Avasure (https://avasure.com/) utilize remote digital cameras and a centralized dedicated observer model to scale the number of patient rooms that can be monitored at one time. These commercial products have documented reduction in fall rates along with reduction in the number of dedicated sitter hours needed. Increasingly, multimodal computer vision monitoring is demonstrating clinical grade accuracy of clinician behaviors (https://www.nejm.org/doi/full/10.1056/NEJMp1716891).4 As patterns of patient behavior are further studied, patient redirection through two-way communication may be supplanted by two-way communication alerting patients that a high-risk event is imminent. In addition to prediction, scalable interventions for potentially adverse events are also needed. In the case of delirium, specific components of this multimodal intervention are active areas of research to determine whether technology can augment in vivo interventions. For example, Munro and colleagues (PMID: 28606450) recently investigated the efficacy of an automated reorientation intervention in a small sample of ICU patients utilizing a scripted message in either a patient’s family member’s voice, a non-family voice, or no message.5 Patients receiving the message in the family member’s voice experienced more delirium free days than either the non-family voice condition or no message condition (p=0.0437). Another example is the Care.coach Corporation. Care.coach uses animal avatars on tablets to interact with patients. These interactions can take the form of medication reminders, maintenance of adherence to treatment plans, or social engagement, among others. 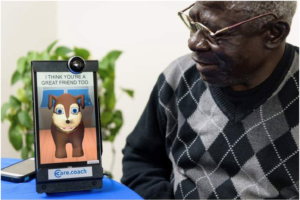 Care.coach has been used in the homes of patients with chronic conditions and has been associated with significant cost savings from reductions in emergency department visits (https://www.wsj.com/articles/for-the-elderly-who-are-lonely-robots-offer-companionship-1527559260). There is also encouraging data that Care.coach avatars can also reduce loneliness, falls and frequency of delirium episodes (manuscript in preparation). Importantly, about two thirds of what is spoken by Care.coach avatars is written out by human specialists working behind the scenes. This human-in-the-loop format provides a unique opportunity to deploy multi-domain interventions efficiently as well as tailor interventions to the changing needs of a hospitalized patients. Future studies should investigate the efficacy and implementation of multimodal computer vision systems for the prediction of adverse inpatient events, and the use of human-in-the-loop avatars to aid in high-quality deployment of multicomponent prevention interventions that can further mitigate hospital acquired conditions. These technologies may just become a new team member for inpatient care. 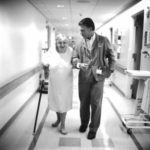 Hospital Elder Life Program. www.hospitalelderlifeprogram.org. Accessed December 20, 2017. Hshieh TT, Yang T, Gartaganis SL, Yue J, Inouye SK. Hospital Elder Life Program: Systematic Review and Meta-analysis of Effectiveness. The American Journal of Geriatric Psychiatry. 2018;26(10):1015-1033. Westle MB, Burkert GR, Paulus RA. Reducing Inpatient Falls by Integrating New Technology with Workflow Redesign. NEJM Catalyst; 2017. Yeung S, Downing NL, Fei-Fei L, Milstein A. Bedside Computer Vision — Moving Artificial Intelligence from Driver Assistance to Patient Safety. N Engl J Med. 2018;378(14):1271-1273. Munro CL, Cairns P, Ji M, Calero K, Anderson WM, Liang Z. Delirium prevention in critically ill adults through an automated reorientation intervention – A pilot randomized controlled trial. Heart Lung. 2017;46(4):234-238. Posted in NIDUS Blog and tagged delirium prevention, mobility, technology.